IHS Markit reported last week that its composite Purchasing Managers Index (PMI) rebounded slightly in its first reading for June 2018. In January, the index had managed nearly 59, the highest in a very long time. It was taken as a definitive sign that Europe’s economy was not only booming, that boom was sustainable. 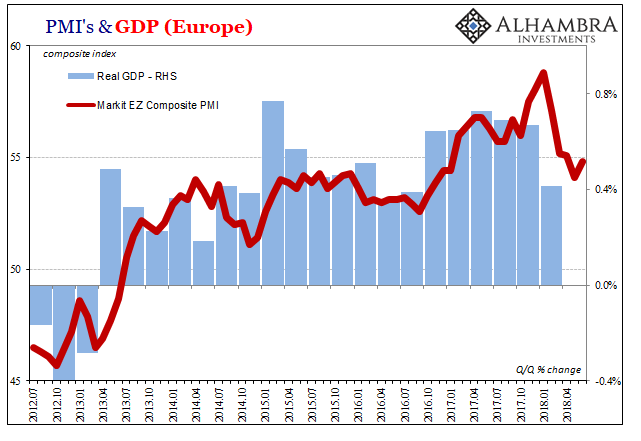 Global liquidations struck at the end of January and now Europe’s economy doesn’t look so steady. In terms of IHS Markit’s PMI, it reached a low in May of 54.1 before picking back up to 54.8 this month. The small rebound was the work of the services sector alone. European manufacturing may be entering a phase of even greater uncertainty. The manufacturing PMI for Europe came in at 55, the lowest in a year and a half. 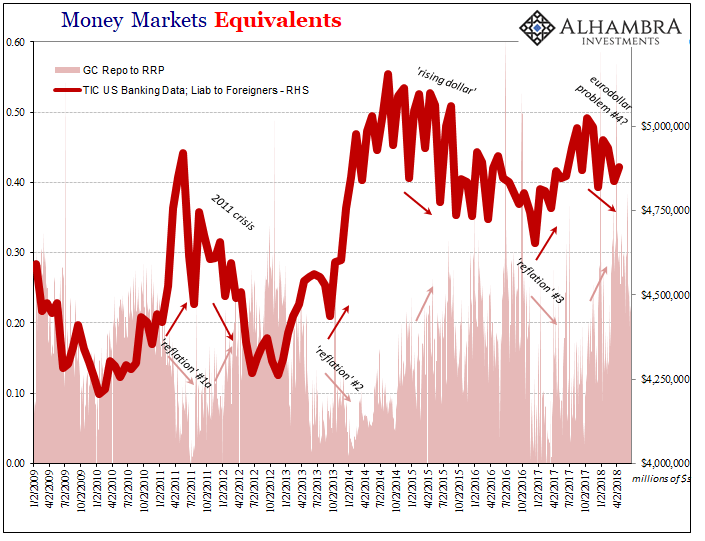 It’s not whether the number is above 50 or not, nor does it matter how far above, rather what these things tell us is the possible marginal direction as it may be changing (second derivative). 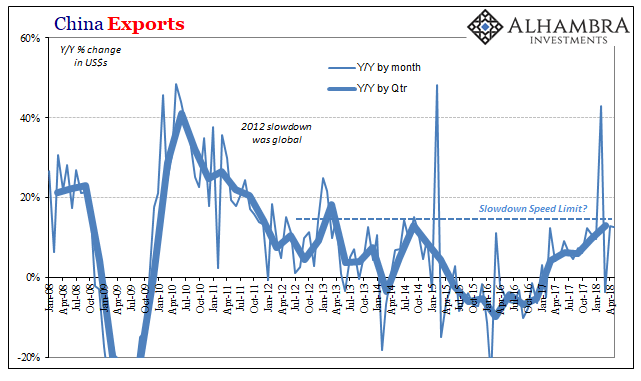 Factory order inflows rose at the weakest pace in 22 months, while export growth remained close to the lowest for over one-and-a-half years. German businesses have got a modest case of the jitters, unnerved by the darkening prospects for global trade. The IFO’s description was much harsher. The index fell markedly in trade. Companies downwardly revised their very good assessments of the current business situation. Their business outlook turned slightly pessimistic for the first time since February 2015. 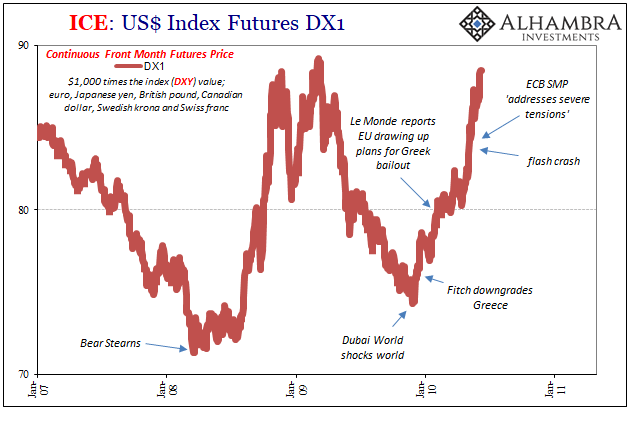 Since the focus is on trade, quite naturally the idea of trade wars appears frequently alongside. What else could it be? It’s interesting, too, how in that prior episode there was also this same tendency to ascribe politics as the reason for the trade breakdown. 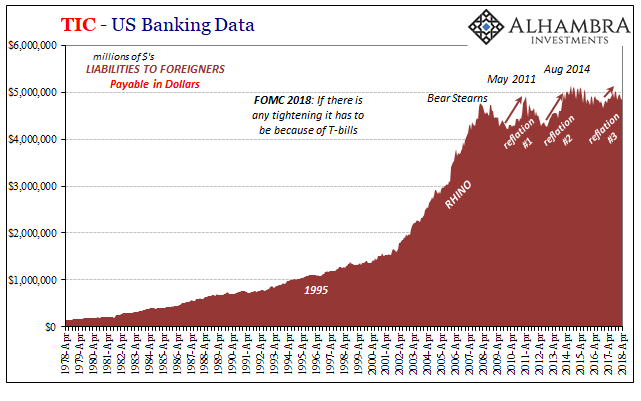 Back in 2010 and 2011, however, it wasn’t trade wars but currency wars that people couldn’t stop talking about. There is actually a Wikipedia page (I know) devoted to the Currency War of 2009-11, because of course there is. Several prominent politicians mentioned their dissatisfaction with how others seemed to be undertaking “competitive devaluations.” How dare they, as if they possessed such control. The first to publicly broach the topic was Brazil’s then-Finance Minister Guido Mantega. 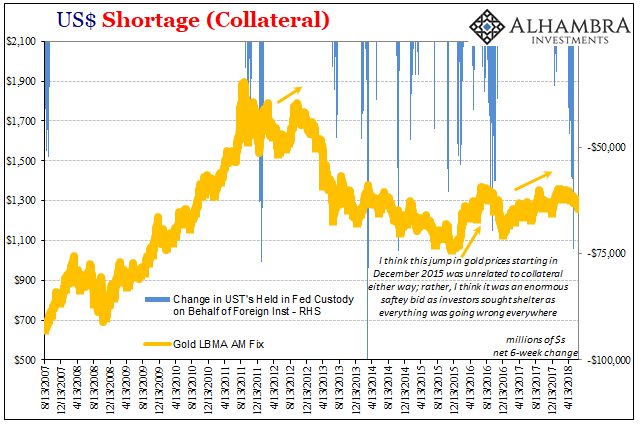 It was in September 2010 in the approach of QE2 in the US that Mantega complained about this currency war. 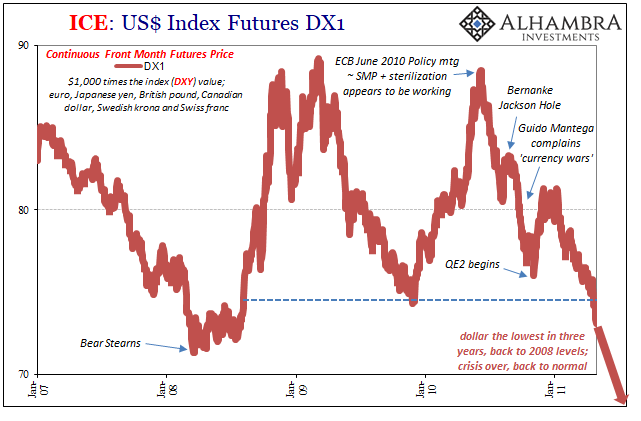 The Fed, everyone thought, was reaching for dollar devaluation or to renew the weak dollar in order to accomplish what the textbooks always say happens. 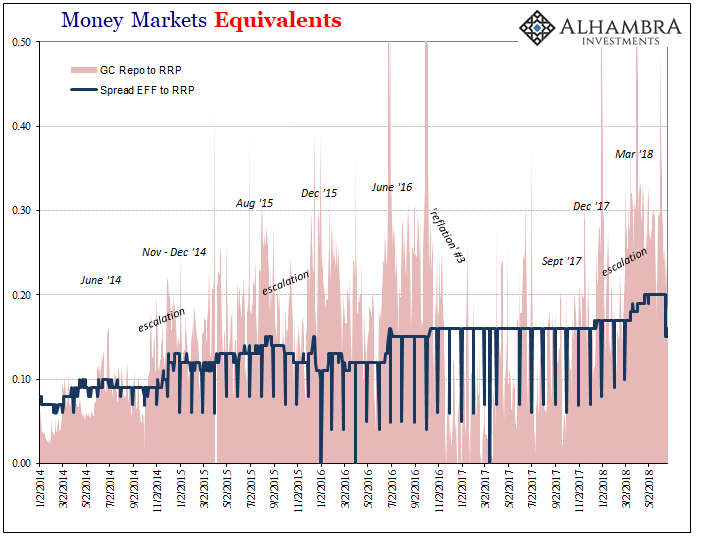 I wrote about this misguided chapter of the “recovery” period in August 2015 quite purposefully three days after China’s big “devaluation” of that month. We never expect politicians to be so clueless about technical issues. Sure, they are blathering idiots about politics, but when a Finance Minister of a major economic power makes some statement about his country’s currency for some reason we take it very seriously. We shouldn’t, as I wrote approaching three years ago. The Wikipedia page doesn’t say much about how that “war” ended in 2011. It, in fact, says nothing at all. Why 2011? We are left to believe that they just died out organically as sane, cooler heads prevailed. 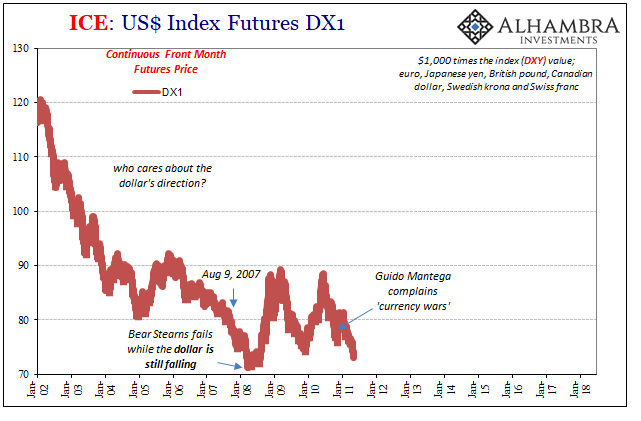 The “currency wars” faded into oblivion toward the middle of 2011 because when the world’s banks are severely “short” eurodollars, synthetically or not, and the supply of eurodollars (in all their forms) becomes acutely restrictive, the proceeding squeeze will quite emphatically reverse all currencies. Guido Mantego was essentially arguing for (and working for) a weak real, which after enough time he actually got. And then regretted. 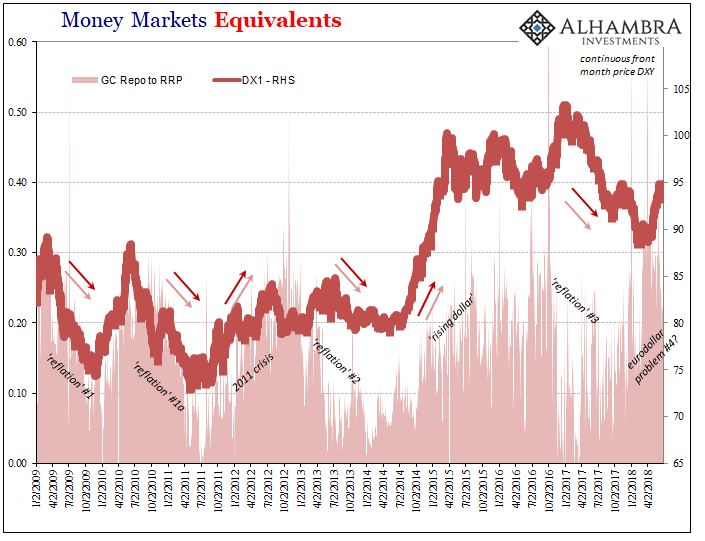 No one complained about the “weak dollar” during the middle 2000’s because it corresponded with very rapid growth especially among EM economies. Global trade flourished. On the other side of the Great “Recession”, even when there were recovery-like prospects it wasn’t the same (this “new normal”). Take away actual global growth and it’s every man for himself, even when that man doesn’t understand what’s really going wrong. 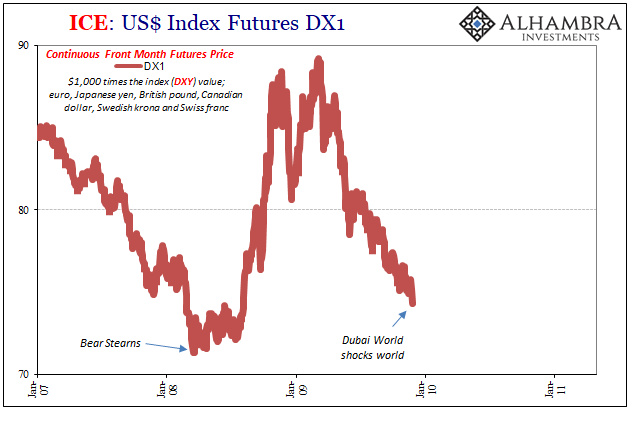 Every time the “dollar” shortage is resumed and it begins to squeeze the global “dollar short”, global trade is the first economic piece affected because it is immediately in the firing line. 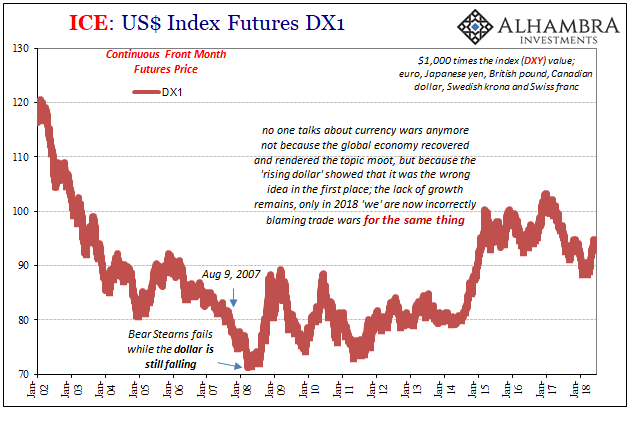 Trade wars may eventually turn out to be a thing, but like perceptions about currency wars correlation is not causation. We have quite a lot of data about that. 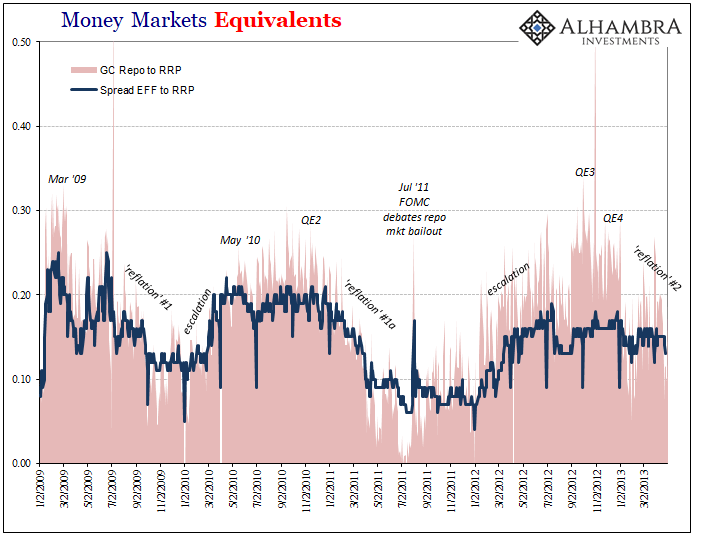 Monetary authorities are every bit as clueless as political authorities on the subject, and are in most cases the basis for the confusion displayed by political authorities, which is why these things keep repeating every few years and the story changes each time. The data, on the contrary, does not.